If you are what you eat and you're regularly ingesting some of these deadly food items, we wouldn't want to meet you in a dark alley. 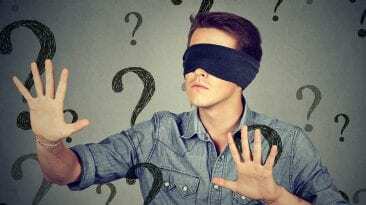 People love to eat what isn’t good for them, but not following a healthy diet and noshing on something that might possibly kill you are two different things altogether. Fugu, the Japanese blowfish that lands anywhere from 35 to 65 people in the hospital each year in Japan, is a prime example of the latter. It’s not uncommon for any one of us to have a hospital visit for food poisoning, but eating some sketchy guacamole doesn’t come with a 6.7% chance of killing you while medical teams are scrambling to hook you up to a respirator. Consuming the ovaries, liver or the intestines of the fugu results in tetrodotoxin poisoning, a substance more lethal than cyanide. What comes next is a numbness around the mouth, paralysis and respiratory failure. Don’t worry, though-all of this occurs while you’re still conscious so you’ll still be able to peruse the dessert menu as you’re suffering. 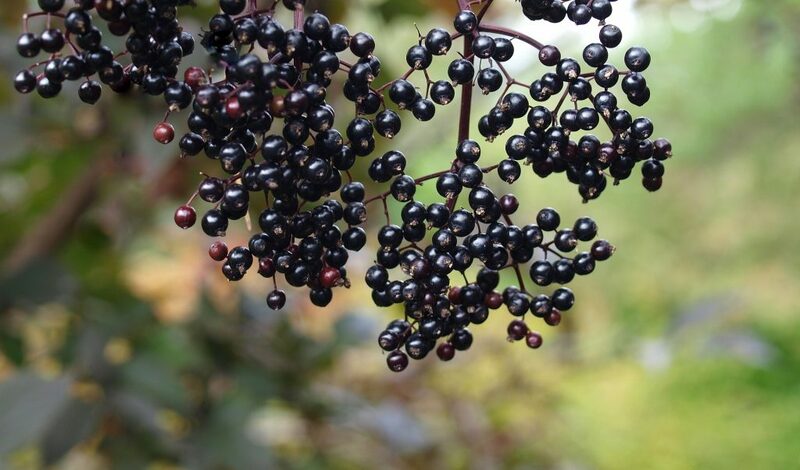 The Black Elderberry shrub grows all over the world, and has a number of medicinal and culinary uses, as well as making a lovely hedge. Its berries are used in making wine, syrups, pies, jams, and other extracts. It is always cooked before use, because the seeds — and about half of each tiny berry is seed — contains a glycoside that induces cyanide, a deadly poison. Cooking destroys these glycosides making the berry safe to eat. If you eat enough raw elderberries, it can cause a toxic buildup of cyanide in the body. You’ll know it if it happens, when you the vomiting and diarrhea kick in. Most people recover pretty quickly, but sometimes the poisoning is particularly bad. But that’s when the coma starts, so you’ll stop noticing. Lucky. The pufferfish or blowfish is called Fugu in Japan, which means “river pig.” But you don’t get bacon from this pig, instead you get dead. 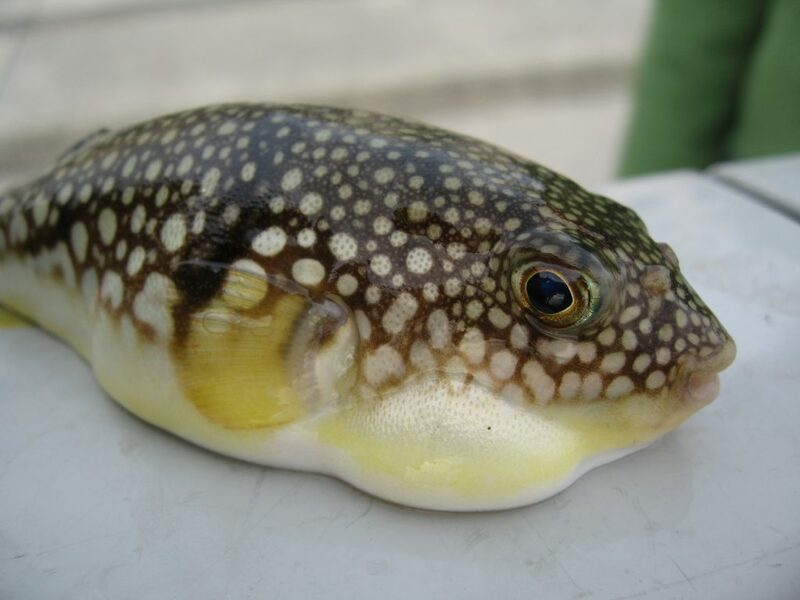 The Fugu contain high quantities of tetrodotoxin, a powerful neurotoxin used to defend against predators in the wild, and exact revenge on humans after the fish is dead. 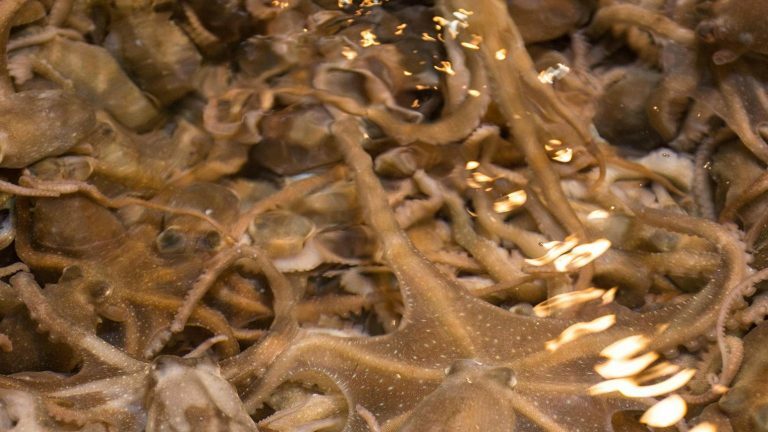 Said to be 1200 times more deadly than cyanide, a pinhead-worth of tetrodotoxin is all it takes to excuse you from the dinner table forever. When properly prepared by a trained and skilled chef, it can be safe to eat. But if during its preparation any of the tetrodotoxin-laced flesh is left, that’s probably your last meal. You particularly want to make sure the liver and ovaries are gone, they’re especially toxic. Improperly prepared Fugu kills about a hundred people a year, as 60% of those exposed to it die. A proper sushi chef is supposed to taste the fish before serving it to make sure it was done right, but you know. As a neurotoxin, the poison acts on a person’s nervous system, rapidly preventing nerves from communicating with one another and the brain. First there’s a tingling in your mouth as the nerves at the point of first contact shut down. 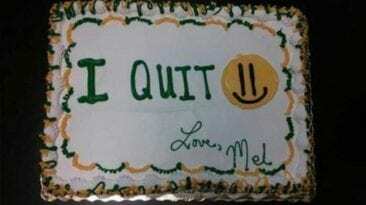 Then come dizziness, nausea, and a nasty headache. It gets hard to breathe. Then your muscles begin to stiffen as you lose control over everything, eventually becoming completely paralyzed. The best part is, you do not lose consciousness, so you are fully and acutely aware of your body’s betrayal. You know exactly what is happening right up to the point where the neurotoxin goes to work stopping your heart and lungs from functioning and anywhere from 20 minutes to a day after eating it, you die. It’s the lungs that will get you first. You will asphyxiate and unless you get some immediate respiratory treatment, you will die. Oh yes, you will definitely die, because there isn’t any antidote. Remember that scene from Indiana Jones and the Temple of Doom where they serve chilled monkey brains still in the monkey’s skull? As it turns out, not only is that really gross, and more than a little cruel, but could also give you brain disease? 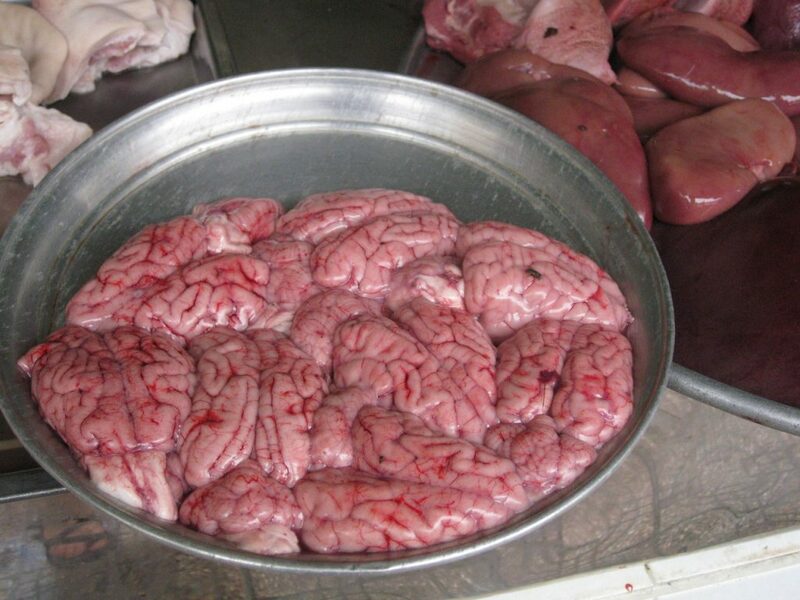 Specifically, monkey brains are known to carry Variant Creutsfeldt-Jakob disease (vCJD), which will kill you. It takes a little over a year to die once infected, but it’s not a pleasant year. 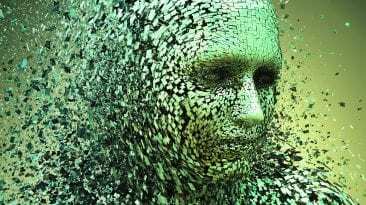 Here’s a sample of the symptoms: dementia, loss of motor control, depression and anxiety, blindness, loss of the ability to speak and understand language, difficulty swallowing, and chronic pain. 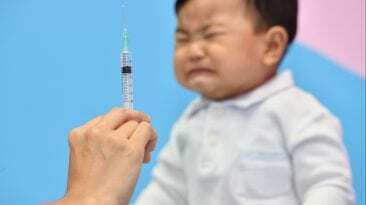 You may not have heard about the risk from eating monkey brains before, but odd are you’re familiar with vCJD whether you knew it or not: it is in the same family of transmissible spongiform encephalopathy as Mad Cow disease. Same deal. Eat some infected animal parts, get sick, die. There is no known cure. There’s no way to slow it down. There’s no way to treat it. You will die. In Egypt the Nile River has always been the bringer of life. Its waters and their predictable seasonal flooding made human life along its banks possible. But in addition to bringing life, the Nile also delivered some other gifts, including an annual bounty of rotting fish every spring as the flood waters receded. Some clever person back in the days of the Pharaohs made the link between these trails of desiccated fish and the magic of the flood season, and decided that to celebrate the spring holiday they ought to eat those fish. The holiday is called Shem al-Nissim, which translates to “smell the breeze,” which can’t be coincidental considering all the rotting fish. 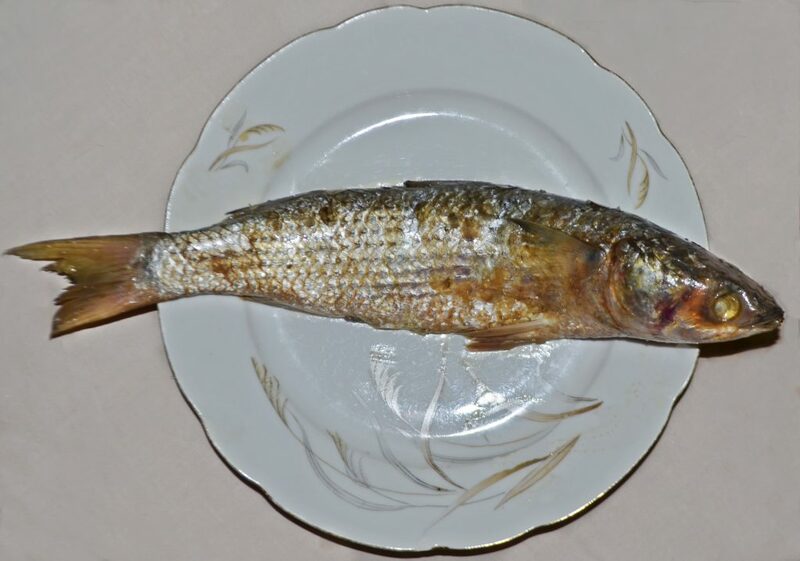 Today, people eat the fish — called Fesikh or Feseekh — as a traditional dish to go along with Shem al-Nissim. Nobody likes it, but hey, it’s tradition. These days they don’t wait for rotting fish to show up, they go ahead and rot them manually. Well, actually, they ferment them, which amounts to more or less the same thing. The fish – a mullet — is dried in the sun and placed in a vat of salty water for a month and half. Technically the salt prevent rotting, but the fish remains raw. It still stinks like it’s rotten, though, with a gooey texture under its gooey grey skin. The problem here is botulism. If there isn’t enough salt or some of the fish did start to rot, the botulism bacteria can have a field day, which ruins everyone’s spring festival. Botulism is a nerve toxin that paralyzes muscles. Its symptoms are similar to a stroke. It can kill you, but it can also be treated with an antitoxin. Oh, and botulism is also injected into people’s faces to make them feel younger. It’s called Botox. Once upon a time, Japan was treated to a visit from the Echizen kurage — Nomura jellyfish — every 40 years or so. Lately, however, they have been inundated with thousands upon thousands of these huge jellyfish every year. It’s becoming a bit of a problem. 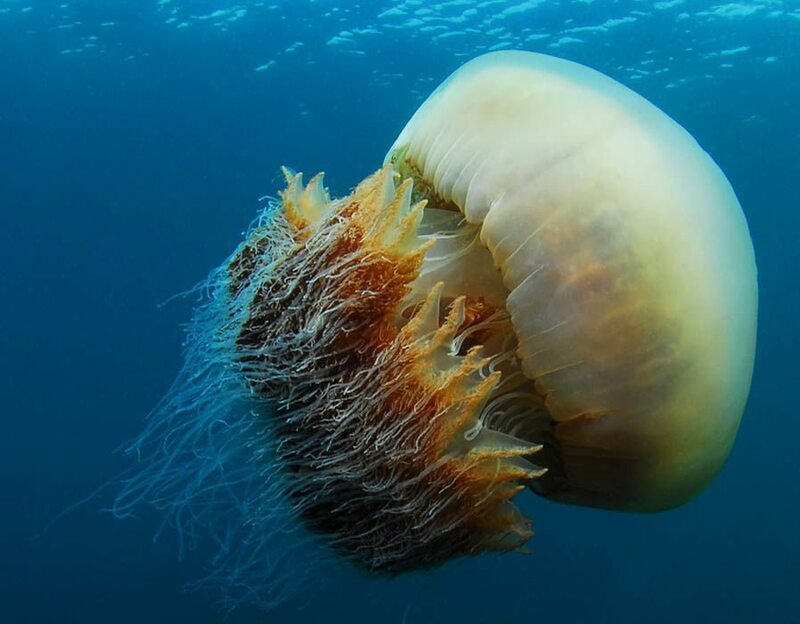 These aren’t little jellies floating around, these are 6 foot wide 500 pound monsters. Fishermen are particularly troubled by them, because it’s next to impossible to drop a net without catching some, and because they are poisonous they sting any fish also caught in the net which renders them all inedible. Nobody knows why the Echizen kurage have changed their behaviour, but there are theories. It’s a pretty sure bet we’re to blame, and the world’s largest hydroelectric dam, the Three Gorges Dam on the Yangtze River in China is a likely culprit. But what are we supposed to do with all these jellyfish? Well, people being people, we’re trying to eat them. One bowl of ice cream at a time. If you cook them — you have cut out the toxic parts and cook them to neutralize any residual poison — you can use them in a variety of foods. The vanilla and jellyfish ice cream is popular, as are a sweet and salty caramel made out of sugar, starch syrup, and jellyfish powder, which is produced by boiling jellyfish into a paste and grinding it into tiny particles. This last one was invented by high school students. Namibian Bullfrogs are mean. They are big — the size of a housecat — they are vicious, and they are hungry. Oh, and they’re poisonous. Their trick is to sit really still under some leaves and stuff, then when something tasty wanders by, like, say, anything that can fit into their enormous mouth and a few other things besides, they pounce. The bottom jaw snaps open and its huge tongue lashes out to grab dinner and haul it back. Then some sharp bits on its jaw hook in and keep the frog’s prey in its mouth. But while they are good at eating, in Namibia they are also considered good to eat. But only at the right time. You have to wait until mating season, which is the “third rain” in that part of Africa. 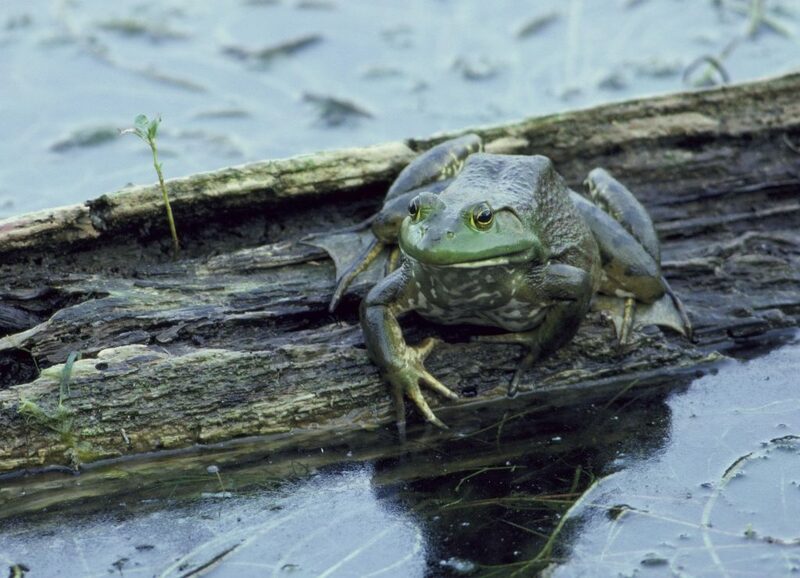 That’s when the bullfrog’s skin and organs are not producing a toxin called “Oshiketakata,” which causes kidney failure. If you are impatient and harvest one of these giant amphibians too early, you can expect a period of excruciatingly painful urination followed by possible death. Why on earth would you call something a blood clam? Because they bleed, duh. Well, all clams bleed, but most of them have clear blood so it just looks like thick water. But Blood Clams have hemoglobin, so their blood is red, like ours. And like our blood, Blood Clams can carry diseases of the blood, like hepatitis, typhoid, and dysentery. 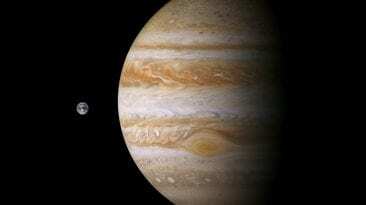 This is because they live in low-oxygen environments where a lot of viruses and bacteria thrive. 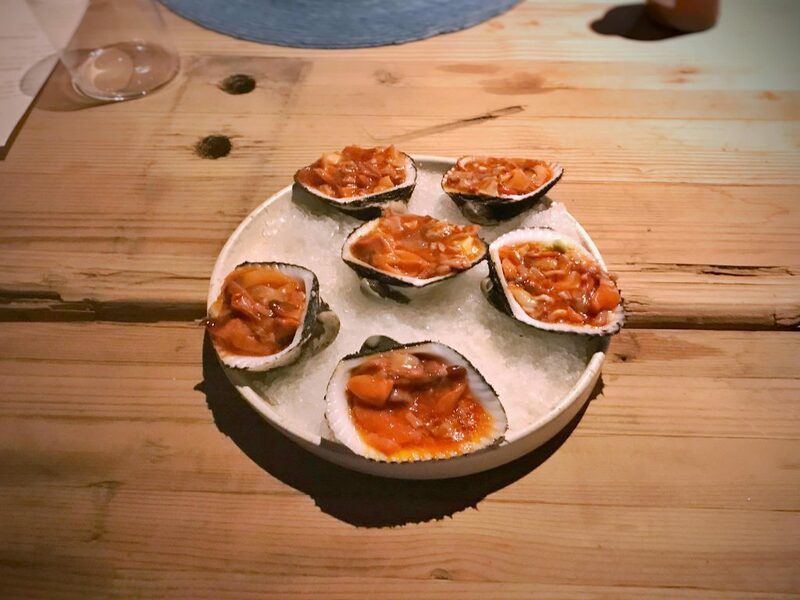 Blood clams filter 40 liters of sea water per day, and the water is dirty — like, say, in most of China — the clams absorb these harmful bacteria and viruses, like, say, hepatitis, typhoid or dysentery. Ever tried to get a cashew out of its shell? Probably not, since cashews are never sold raw in the shell. 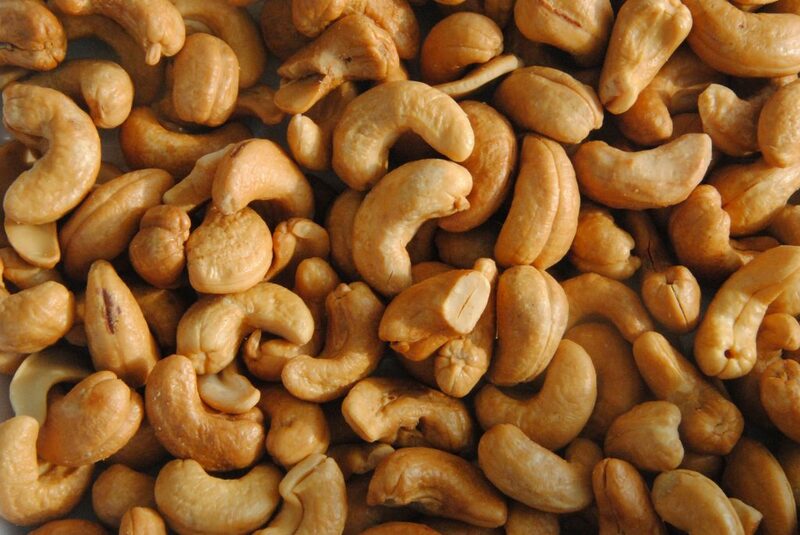 That’s because cashews contain anacardic acid, the same chemical irritant that makes poison ivy so much fun. The “poison” is in the oil of the shell, not the nut itself. But when it comes out of the shell the nut is covered in the stuff. Handling the shell of eating the raw nut can cause a reaction. To render it safe to eat, the nut is roasted to eliminate the acids in the shell oil. But it has to be done at high enough temperature, or traces may remain. And if you’ve ever seen a severe allergic reaction to poison ivy on someone’s skin, imagine that on the inside. If you’re ever in Korea and feel like living dangerously, order the Sannakji. Just don’t be surprised that when your plate arrives, what’s on it is still moving around. 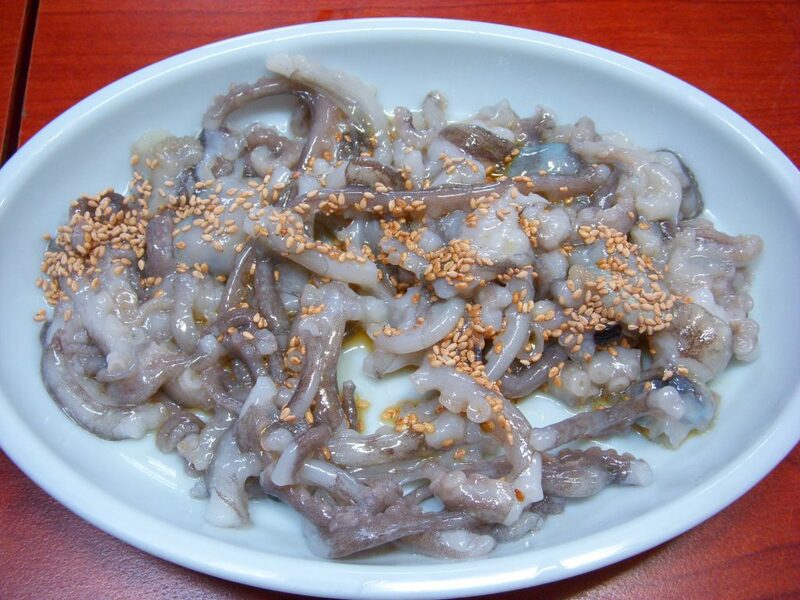 You’ve just ordered wriggling octopus, made from an extremely fresh baby octopus. So fresh, that it was alive a few seconds before being served to you. Raw. And wriggling. Be sure to chew. A lot. Because every year a few people die from choking because one of those wriggly octopus legs gets caught in their throat. Meet the world’s most dangerous cheese. 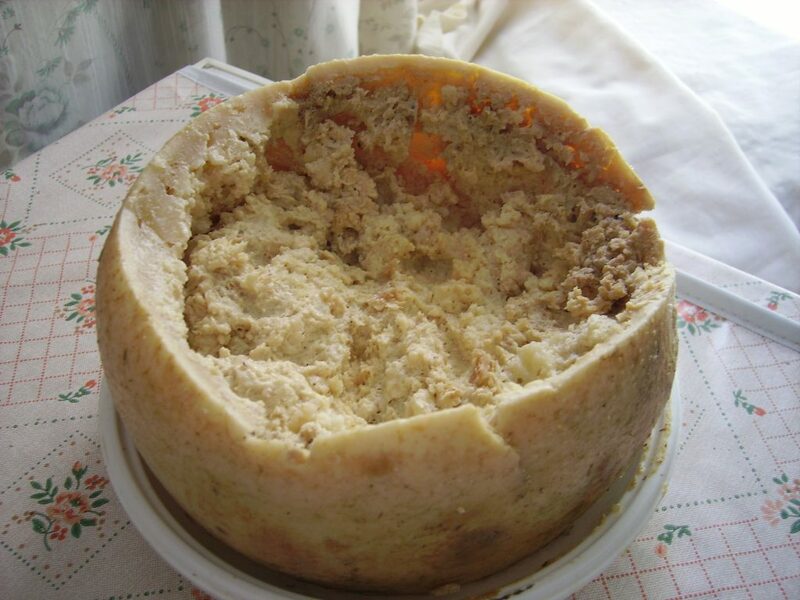 Casu Marzu begins as pecorino cheese, but then takes on a life of its own — literally — when it is cut open and left outside so it can become infested with larvae. First the flies come and lay eggs in it, which of course hatch into larvae. Happy larvae, as it turns out, because they can immediately start feasting on yummy cheese. As the baby bugs eat, this starts decomposing the cheese. Believe it or not, this is what we want to happen. Not surprisingly, the cheese becomes extremely soft, and a liquid starts seeping from it. This liquid is called lagrima, but giving it a name does not make it any less gross. What happens next is that people eat the cheese. No, we’re not shitting you, they really do. No, they don’t remove the fly larvae first, they eat those squirmy white worms too. And just when you thought it couldn’t get worse, let us tell you why it’s best to cover the cheese with your hand before you take a bite: the larvae get disturbed when you eat it, so they start jumping out. Not crawling out, jumping. Up to 6 inches. But as bad as all this is, it still gets worse. Because eating the larvae doesn’t kill them. So as you digest the rotten cheese they once called home, they start looking for a new place to live. And since they are inside you, guess where they choose? It certainly felt weird when the larvae when down your throat, but it definitely feels a whole lot worse when they start boring through your intestinal walls. Ackee – Unripe Ackee fruit contains hypoglycin, a poison that causes what’s called “Jamaican Vomiting Sickness” which apart from making you vomit, can also kill you. Once it ripens, it’s safe to eat the yellow fruit, just never eat the seeds, they are always toxic. Rhubarb – While the stalks might be delicious in desserts, don’t eat the green leafy bits — too much can poison you. Cassava – You might know it better as tapioca, but when Cassava is not prepared properly it can produce cyanide. Hakarl – An Icelandic treat invented by Vikings, Hakarl is fermented shark. Just one problem, the shark meat contains poisons like trimethylamine oxide and uric acid, so although they proper preparation involves burying the whole shark in the sand and covering it with rocks for a few months to ferment it and let the poisons seep out along with all the liquids, sometimes it doesn’t always work the way it’s supposed to. Why Do People Love Eating Dangerous Foods?